This year’s Amazing Spider-Man was, as promised, amazing, but in one specific way that I did not expect. This most recent comic book film made the excellent leap of developing the non-hero characters as well as the hero. Remember the days when Superman had daily dalliances with Lois Lane without her ever guessing his secret identity, solely due to the not-so-fantastic disguise of a pair of glasses? Now, now, I've heard the argument (even used it myself) that Clark is so drastically different from Superman in the way he comports himself (hunched over, shy, clumsy) that even without the glasses, the thought that he could even be related to the heroic, infallible Superman seems beyond the bounds of imagination? In Superman Returns (2006), Lois does seem to question the link between Clark and Superman herself, in a surprising moment of unvoiced clarity. She sees Clark without his glasses and pauses, as if considering the possibility, but then she scoffs and shakes her head as if to say, “Not in a million years.” The implication of this reasoning being that Lois does not see Clark for who he really is not because of his glasses and behavior, but because her own preconceived notions have created a cavernous separation between man and super-man. Despite this attempt at an explanation, his has long been a qualm of comic book readers and non-nerds (nerd here is positive, people, we are awesome) alike. How can Lois fail to see what is right in front of her every day? Not to mention the fact that Clark (in the 2006 film) just happens to return to Metropolis on the very day that Superman returns to earth, both men having been gone for exactly the same amount of time. For an investigative journalist, Lois certainly does not rely on her deductive reasoning. Happily, I believe this most recent comic book film has assuaged all of my questions on this subject. The Amazing Spider-Man (2012) does not play the same dance of superhero/secret identity played out in so many other movies. Realistically, wouldn't you recognize the voice or shape of your long-time beau as he whisks you off your feet? One of the steps taken away from this ridiculousness appears in Batman Begins (2005); the film addresses this issue by having Bruce disguise his voice when he speaks as Batman (I love this in spite of the way Batman’s voice sounds like it is coming from the throat of an eighty year old chain smoking crone). Even the box-office failure Green Lantern (2011) presents its own humorous take on the requisite encounter between the hero and his love interest: “Hal?” to which our hero says, “How did you know it was me?” and our lovely leading lady responds, “What do you mean? I’ve known you my whole life! I’ve seen you naked! You didn’t think I would recognize you because I can’t see your cheekbones?” Eloquently put, and unfortunately the most enjoyable part of the film. 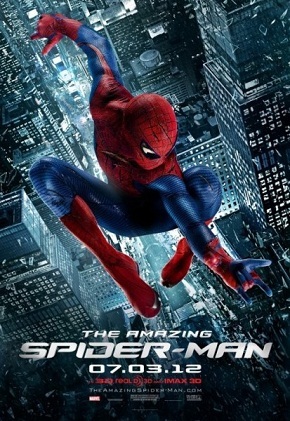 The Amazing Spider-Man completes this arc with the comparably swift revelation early in the film of Peter's secret identity to his girlfriend Gwen Stacey. This allows for newer, more complex questions of whether either of them wants to stay together knowing the danger Gwen might face (being the girlfriend of Spider-Man). The best part of the inclusion of intelligent non-hero characters comes in the form of Aunt May's knowing look, directed at Peter when he returns home after the climax of the film, having defeated the enemy and saved the city. Clever Aunt May has been watching the news, and has seen Peter's transformation, and even a bit of his power (she watches him grab a fly out of the air and release it unharmed), and without the dramatic speeches typical of the genre, the audience knows with certainty that she has figured out that her nephew is Spider-Man. The subtle revelation makes it that much more interesting when Aunt May watches the events unfold on her television screen with white knuckles and tears in her eyes. The movie is awesome because it does not assume that the non-heroes in these stories, or the audience members themselves, need to have each detail spelled out for them. This is magical storytelling that keeps audiences from asking how anyone could be so ignorant and drawing them out of that slack-jawed daze, that obliviousness to time, that demonstrates true absorption in the work. We can watch in fascination as the film weaves a tale focused not on a single individual’s struggle with superpower, but on the ripples in complex, character-based relationships that his discovery creates.